The Defense Ministry of Ukraine is at the stage of completing the reform of its structural units, Minister of Defense Stepan Poltorak has said. 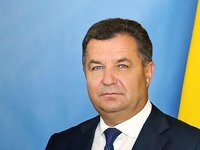 "The Ministry of Defense is at the stage of completing the reform of the structural units of the Ministry itself, in which the functions, tasks and responsibility for the direction of activity have been changed," Poltorak said after the events at the Defense Ministry on Saturday. According to him, the Ministry of Defense is switching to a new format, providing for increased civilian control over the Armed Forces of Ukraine. "The deputy ministers of defense are political figures, and civil servants - heads of departments, offices and divisions - all of them are appointed on a competitive basis. Competitions have been announced and are being held within the last six months," Poltorak said.